The azimuthal quantum number is a quantum number for an atomic orbital that determines its orbital angular momentum and describes the shape of the orbital. The azimuthal quantum number is the second of a set of quantum numbers which describe the unique quantum state of an electron (the others being the principal quantum number [following spectroscopic notation], the magnetic quantum number, and the spin quantum number). It is also known as the orbital angular momentum quantum number, orbital quantum number or second quantum number, and is symbolized as ℓ (pronounced ell). The atomic orbital wavefunctions of a hydrogen atom. The principal quantum number (n) is at the right of each row and the azimuthal quantum number (ℓ) is denoted by letter at top of each column. Connected with the energy states of the atom's electrons are four quantum numbers: n, ℓ, mℓ, and ms. These specify the complete, unique quantum state of a single electron in an atom, and make up its wavefunction or orbital. The wavefunction of the Schrödinger equation reduces to three equations that when solved, lead to the first three quantum numbers. Therefore, the equations for the first three quantum numbers are all interrelated. The azimuthal quantum number arose in the solution of the polar part of the wave equation as shown below. To aid understanding of this concept of the azimuth, it may also prove helpful to review spherical coordinate systems, and/or other alternative mathematical coordinate systems besides the Cartesian coordinate system. Generally, the spherical coordinate system works best with spherical models, the cylindrical system with cylinders, the cartesian with general volumes, etc. Illustration of quantum mechanical orbital angular momentum. is the wavefunction of the electron. The quantum number ℓ is always a non-negative integer: 0, 1, 2, 3, etc. While many introductory textbooks on quantum mechanics will refer to L by itself, L has no real meaning except in its use as the angular momentum operator. When referring to angular momentum, it is better to simply use the quantum number ℓ. Atomic orbitals have distinctive shapes denoted by letters. In the illustration, the letters s, p, and d (a convention originating in spectroscopy) describe the shape of the atomic orbital. 1 p 6 principal three dumbbell-shaped polar-aligned orbitals; one lobe on each pole of the x, y, and z (+ and − axes); two electrons each lobe. The letters after the f sub-shell just follow letter f in alphabetical order except the letter j and those already used. 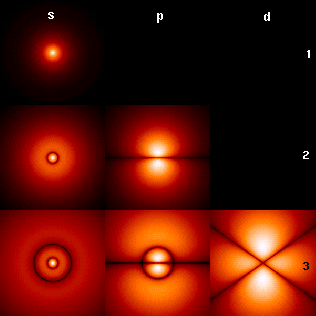 Each of the different angular momentum states can take 2(2ℓ + 1) electrons. This is because the third quantum number mℓ (which can be thought of loosely as the quantized projection of the angular momentum vector on the z-axis) runs from −ℓ to ℓ in integer units, and so there are 2ℓ + 1 possible states. Each distinct n, ℓ, mℓ orbital can be occupied by two electrons with opposing spins (given by the quantum number ms = ±½), giving 2(2ℓ + 1) electrons overall. Orbitals with higher ℓ than given in the table are perfectly permissible, but these values cover all atoms so far discovered. For a given value of the principal quantum number n, the possible values of ℓ range from 0 to n − 1; therefore, the n = 1 shell only possesses an s subshell and can only take 2 electrons, the n = 2 shell possesses an s and a p subshell and can take 8 electrons overall, the n = 3 shell possesses s, p, and d subshells and has a maximum of 18 electrons, and so on. Generally speaking, the maximum number of electrons in the nth energy level is 2n2. , Pfund series (mid-wavelength infrared). are quantum numbers corresponding to the magnitudes of the individual angular momenta. "Vector cones" of total angular momentum J (purple), orbital L (blue), and spin S (green). The cones arise due to quantum uncertainty between measuring angular momentum components (see vector model of the atom. where Ji stand for Jx, Jy, and Jz. So that j is related to the norm of the total angular momentum and mj to its projection along a specified axis. As with any angular momentum in quantum mechanics, the projection of J along other axes cannot be co-defined with Jz, because they do not commute. j and mj, together with the parity of the quantum state, replace the three quantum numbers ℓ, mℓ and ms (the projection of the spin along the specified axis). The former quantum numbers can be related to the latter. Furthermore, the eigenvectors of j, s, mj and parity, which are also eigenvectors of the Hamiltonian, are linear combinations of the eigenvectors of ℓ, s, mℓ and ms. The azimuthal quantum number was carried over from the Bohr model of the atom, and was posited by Arnold Sommerfeld. The Bohr model was derived from spectroscopic analysis of the atom in combination with the Rutherford atomic model. The lowest quantum level was found to have an angular momentum of zero. Orbits with zero angular momentum were considered as oscillating charges in one dimension and so described as "pendulum" orbits. In three-dimensions the orbits become spherical without any nodes crossing the nucleus, similar (in the lowest-energy state) to a skipping rope that oscillates in one large circle. ^ Eisberg, Robert (1974). Quantum Physics of Atoms, Molecules, Solids, Nuclei and Particles. New York: John Wiley & Sons Inc. pp. 114–117. ISBN 978-0-471-23464-7. ^ R.B. Lindsay (1927). "Note on "pendulum" orbits in atomic models". Proc. Natl. Acad. Sci. 13: 413–419. Bibcode:1927PNAS...13..413L. doi:10.1073/pnas.13.6.413. PMC 1085028. PMID 16587189.